So you come up with an awesome phrase that would be perfect for a mug, a t-shirt, a card, or a hat. Can you run down to the Trademark Office and file a trademark for that phrase? 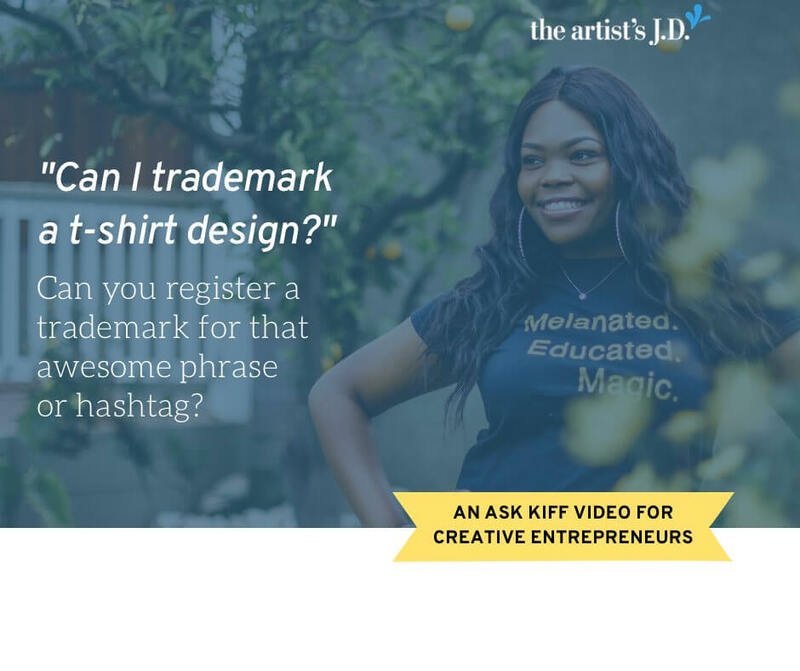 Before you try to trademark a t-shirt design, make sure you check out this week’s episode of Ask Kiff. 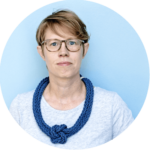 Learn why I am very anti-DIY for business owners to file their own trademarks (including using services like LegalZoom). Get instant access to a workshop recording breaking down the 5 steps involved in getting a trademark. So you come up with an awesome phrase that would be perfect for a mug, a t-shirt, a card, or a hat. Can you run down to the Trademark Office and file a trademark for that phrase? So we know that short phrases don’t get copyright protection. But we hear about all the time, in the news, people running to the Trademark Office and filing trademarks for phrases that appear on hats or t-shirts. So can you do that? And is it a smart thing to do? Before we get into that let’s remember why trademarks exist. Trademarks exist for consumer confusion. So that consumers know when they see a specific phrase that they know who is providing them that product or service. Yes, there are Old Navy shirts and other pieces of clothing that say Old Navy on the front of them. But just because it says Old Navy, doesn’t necessarily mean that I know that Old Navy is telling me that clothing. 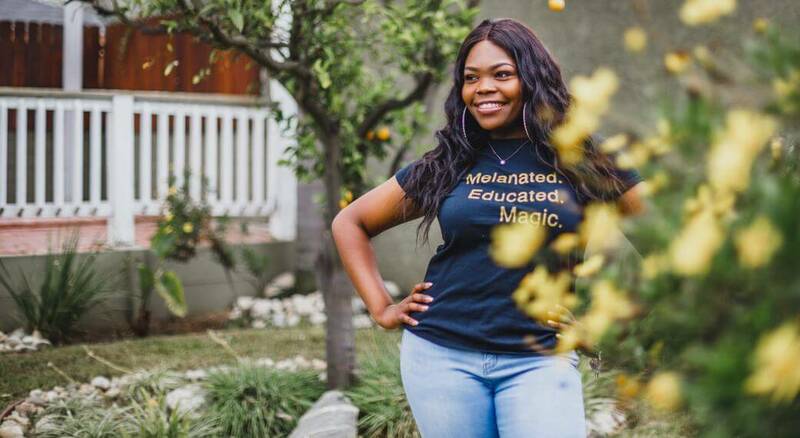 Now Old Navy is probably a bad example when it comes to something on the front of the shirt because it is a very well-known brand. But if Old Navy and Anthropologie were both selling shirts that say “Love Wins” on the front, I wouldn’t assume that Love Wins is the company that is selling me the clothing. I would look inside the shirt and look at the sewn-in tag to figure out who the maker of the shirt was. So the same exact thing applies here. So if you come up with a great phrase, yes, you can run down to the Trademark Office and file a trademark application for it. There’s nothing that’s going to prevent you from doing that. And the USPTO will gladly take your money. The problem is going to arise as you go through the process of getting the trademark. Filing an application doesn’t mean you have the trademark. You still have to go through the review process. And there are two parts of the review process that you might get hung up. The first part is if you’ve already got the t-shirts and as part of your application, you submit a photograph of the front of the t-shirt to say USPTO this is how I’m using the t-shirt to sell my product or service. The USPTO is going to issue what’s called an Office Action to say we don’t necessarily agree with that. And that’s because of the exact reason we talked about before. If I see a Love Wins shirt, I’m not gonna think that Love Wins is selling me the shirt. I’m gonna look inside. And look at that tag that sewn-in tag or that printed-on tag to figure out who is making the shirt. Show us some other proof that was created by the date that you submitted the application, in order to get your trademark. So that’s the first place you may run into problems. The second place you may run into problems is if you file your application, and you say I’m not using it yet. If you file it on what’s called an Intent To Use basis. You’ll make it further through the application process. And at the end of the application process, in order for your trademark to become official. Again, you’re gonna have to submit that proof. So the short version, putting something on the front of the t-shirt. Yep, you’ll be able to file an application. 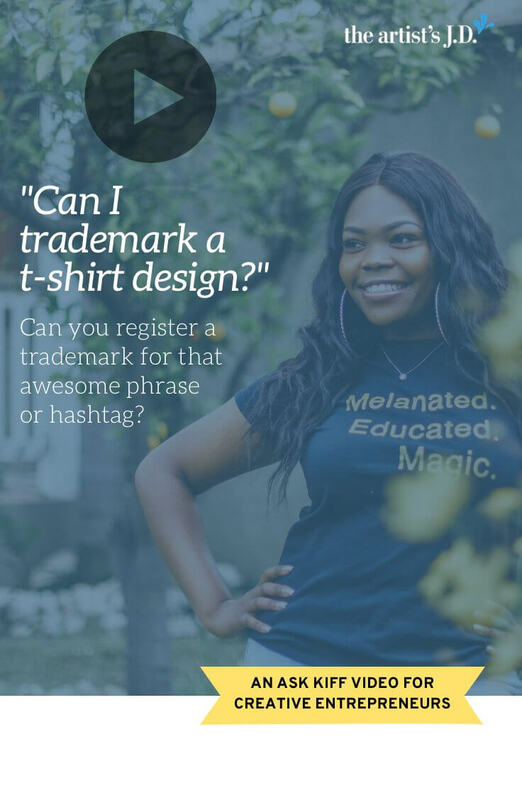 But you’re not going to be able to get the registered trademark just by putting a phrase on the front of t-shirts, mugs, cards, hats, and the like. Instead, you’ll have to take it to another level. And make sure that your e-commerce store, that the hangtags, that the sewn-in tags, that the printed-on tags all identify that same phrase as the person who is providing those shirts to consumers. Ask Kiff will be back after the Thanksgiving holidays. And we’ll be talking about how you’re going to use all of that feedback and testimonials that are amazing, that you’re getting from your clients and customers over this holiday season, next year to sell more products. Got a question you want me to cover an upcoming episode? Leave it in the comments below. Thanks so much for tuning in and I’ll see you soon.